Maintaining a level of true metal while adding in a dash of power and thrash presence to the music, Evil Conspiracy from Sweden made a mighty impression with their second full-length Evil Knows. Keeping the songwriting mechanics and execution on a street-level, it’s obvious through songs like “We Rise” and “Violent Intent” that as much as the band loves Mercyful Fate, Judas Priest and Accept, they also have strong ties to Metal Church and early Metallica- ensuring a primal headbanging experience from first note to last. They’ve handled the downtime and setbacks that can happen in a 17 year plus career quite well, appearing primed and ready to establish themselves globally in a very crowded scene. We reached out to bassist Martin Giaever who took us through a bit of the history with Evil Conspiracy, the reasons for long gaps between their first and second albums, the challenges facing the band, and the diverse tastes which help account for the varied musical approach you hear on their records. Dead Rhetoric: What are some of your first memories surrounding music growing up? What bands or albums do you believe made the most impact for you to pick up an instrument and eventually playing and performing in heavy metal? Martin Giaever: My first heavy metal experience was in 1985 when I was around four years old, when my older brother bought the Stay Hungry album by Twisted Sister, and of course “We’re Not Gonna Take It” soon became my personal favorite. Then just one year later a friend of mine got Europe’s The Final Countdown on cassette for his birthday and brought it to our kindergarten. So the title track quickly became the soundtrack of my life and has been since then. Dead Rhetoric: Evil Conspiracy started in 2002 although you were originally called Legions for two years previous. What do you remember about the early days of the group – did you know right away the style of power/thrash metal you wanted to develop? Giaever: I joined the band along with our former drummer in 2002. I had heard about the band before and got to know Patrik when I started at the same daytime job as him. Their bass player was about to move to another town and the guys needed a new drummer as well. Shortly thereafter we found out that there was another band called Legions so our singer at that time came up with a new name and Evil Conspiracy was born. Legions already had some songs in the power metal style when I joined them so we just continued on that path. Dead Rhetoric: The band would record four demos between 2003-2006 – what can you tell us regarding these recordings, what do you feel were the good aspects for each and what do you believe you learned from each recording – were these readily available to the public and if so, how were they received? Giaever: We were very productive the first years and could record demos for free by the municipal music school. We made all the recordings by ourselves and weren’t that experienced so the quality of the productions weren’t that good all the time. But we printed our demos on CD and used to sell them at our shows so we could finally save up some money to make a little more professional recording for our fourth demo, using Simon Johansson (Memory Garden) and Mike Wead (King Diamond) as producers. Allthough we got good reviews on all our demos no labels took interest in us. Giaever: After the third demo recording our singer quit the band. After that we had some singers that would come and go, and our drummer crushed his kneecap falling from a stair at my birthday party. So we couldn’t do so much except writing new songs during his convalescence. Fredrik joined us in 2009 so we played some shows before we decided to record a full length-album and see if any label would be interested in releasing it. I joined another band beside Evil Conspiracy that got signed by Sliptrick quite fast (Arsenite) and Evil Conspiracy would get signed by them as well shortly thereafter. Dead Rhetoric: The new album Evil Knows recently came out on Sliptrick Records – but has been in development for years. Tell us how you came to sign with Sliptrick, and why do you believe it took 4 ½ years between releases for the band? Giaever: Sliptrick released the first album and came up with the best offer for the second one. The reason it took some time to finish the second album was because we had to let the drummer go almost immediately after the first release because of personal reasons. Then we struggled to get a decent replacement for some time. We had tried out a couple of drummers when Henrik whom I had played with in Arsenite became available. Then after his arrival we played a few shows with him before we started to record the second album. Dead Rhetoric: Where do you see the development of the band from your debut album to this newest release? Were there specific areas as far as recording, songwriting, or performances that you made more of a conscious effort to become stronger? Giaever: The first album was somewhat of a ‘best of’ from our previous demos with a few new songs added to it. For the second album we had three old songs and wrote seven new ones. We started out as a pure power metal band at the beginning but have become heavier and a bit more thrashy but still melodic during the years. So I think both albums are a perfect mix of all that. Dead Rhetoric: How would you describe Evil Conspiracy when it comes to your live performances? What do you hope the audience is able to get from the band, and what have been some of your favorite show/festival memories to date? Giaever: Evil Conspiracy is a band that gives it all and just go nuts when it comes to live performances. I hope the audience is able to get sweaty, singalong and just have a good time with us and scream for more. We’ve had some shows during the years as support for more famous bands like Sabaton, Hammerfall, etc. that were really fun, and we got to play a local festival near our hometown in 2016 called Metallsvenskan on a big stage that was truly a blast! Dead Rhetoric: What do you see as the biggest challenges facing Evil Conspiracy currently? How active is the band in promoting their work beyond the label promotion when it comes to social media and technology? Giaever: The biggest challenge is to stand out in the competition among other bands in our style and get gigs. We are also working on getting a European tour and festival shows. Besides label promotion we try as hard as we can to promote ourselves on Facebook, YouTube etc. We have a music video for “Dogs ov War” and a lyric video for “Golgotha” out, and we will release more videos later this year. Dead Rhetoric: What are your thoughts on the metal scene – both within your home country of Sweden as well as the global outlook? Are there aspects that you feel need to be changed or improved to make things better for the fans, musicians, labels, promoters, and venues in general? Giaever: During the 90’s there wasn’t that much of a metal scene at all, at least not for melodic metal bands like us but it got better in the beginning of the 2000’s. Especially in Sweden and the rest of Europe. There is also a lot of metal festivals all over Europe nowadays that didn’t exist twenty years ago. When it comes to smaller bands like Evil Conspiracy it’s hard to get gigs at least here in Sweden. There are so many bands like us competing to play and not so many venues, and it’s hard to get to play at festivals if you’re not already famous. Mostly bands like ours have to pay to play, but we try to make the best of it. Dead Rhetoric: What worries you most about the world that we live in today? Where do you think people need to put their minds and efforts to improve things for the better that maybe they aren’t as conscious of as they should be? Giaever: I try not to worry so much at all. It is what it is, and my intention is to entertain people with our music, giving the audience a good time and forget about politics and such for a while. Dead Rhetoric: What are some of your hobbies and interests away from music? 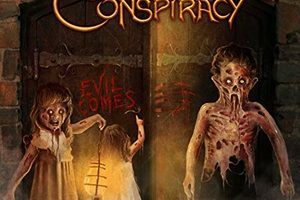 And how would you describe the personalities within Evil Conspiracy and what each member brings to the table to make the band special and unique? Giaever: We all likes to go festivals and concerts. Beside that I like trout fishing, Fredrik likes hunting and clay shooting, Andreas interests are music, music and more music and spending time with family and friends. Patrik likes karate, spending time with his family and cleaning up after his dogs mistakes and Henrik likes video games. Fredrik and I are the goofy ones that fool around and make the other guys laugh and sometimes they get tired of us. Andreas writes a lot of the music although everyone contributes with that. He is also the go to-guy when it comes to booking gigs, contact with the label and so on. Patrik is very practical making posters for our live shows and such. Henrik is our youngest member and brings youth and make us old farts at least feel a little more younger than we are. Although most of the music for our second album was already written he came up with some lyrics for some of the songs beside his heavy pounding on the drums. 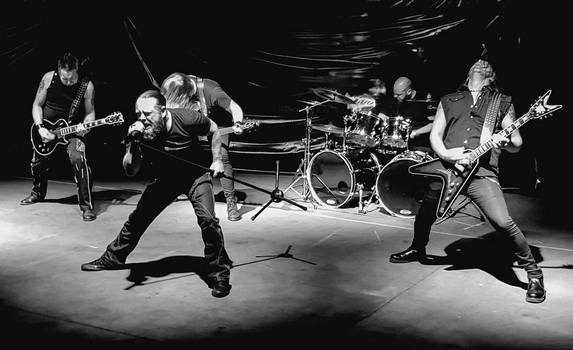 Dead Rhetoric: Who would you consider the ideal metal bands to model Evil Conspiracy after – when looking at not only their discography, but the way they conduct themselves on stage and off as far as their fans? Have any members had any special fan encounters with bigger metal acts that have stayed with them forever? Giaever: From the beginning Evil Conspiracy were very inspired by speedy and melodic bands like Helloween and Gamma Ray and have over the years become more into the style of Accept, Judas Priest and so on with a little touch of thrash bands like Testament musically. On stage performance we are also inspired by Accept and Judas Priest with the synchronized guitar-swinging moves and stuff like that. We have played with some bands that we look up to through the years. We are all huge fans of Accept, Judas Priest, Twisted Sister and besides that for me Iron Maiden, Yngwie Malmsteen, King Diamond, Europe and Manowar has become house gods. Andreas and Patrik are huge fans of Dream Theater, Pantera, and Machine head. Henrik likes Slayer, Pantera, Kreator etc. Fredrik likes Mercyful Fate and Johnny Cash among others. To sum it all up we like almost the same bands in the end. Dead Rhetoric: What’s in the future for Evil Conspiracy over the next year as far as promotion, touring, and other music activities? Giaever: We hope to get more gigs, tours and festivals booked, and we’re gonna get some more videos out. Then there’s gonna be some more songwriting along the way for the next album. We hope that this album is gonna help us to reach the next level and get us more fans. It’s a hard job, but a fun job!